Passion matters. If there’s a lesson to be drawn from many of the films in the New Cult Canon—specifically the ones that died in theaters, only to find a following down the line—it’s that the passionate few speak louder than the passive many. That may not always register in dollars and cents, but it’s what keeps low-rated TV shows alive, sustains talented artists whose appeal often eludes the mainstream, and tends the garden of cinema history long after blockbusters have faded. In the Internet age, the effect has been amplified tenfold, as nerdy legions have united to wage successful campaigns large and small, from making an 18-year-old Rage Against The Machine song Britain’s No. 1 Christmas single to forcing renewals of struggling shows by sending 20 tons of peanuts to network headquarters (Jericho) or buying Subway sandwiches en masse (Chuck). 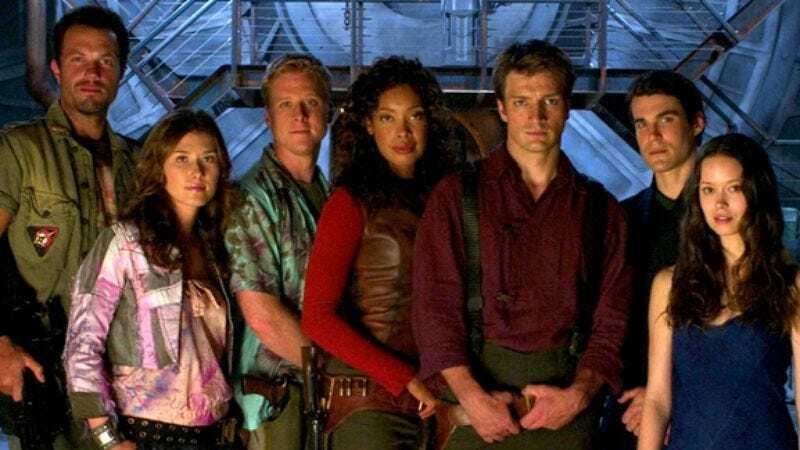 Had Whedon’s brilliant 2002 space-Western series Firefly been around in the age of Twitter and Facebook and DVRs, perhaps it wouldn’t have been yanked from Fox after 11 of its 14 episodes aired. No matter. The passion index was high enough for Whedon to convince Universal to bankroll a modestly budgeted feature to resolve the questions left unanswered by a failed TV show. And really, there was genuine logic behind it: Firefly’s core fan base—called “The Browncoats,” after the collection of rogue heroes at the show’s center—could be counted on to buy tickets, and their advocacy (not to mention the quality of the material) might persuade the uninitiated to give it a shot. And thus 2005’s Serenity, Whedon’s feature debut as writer-director, found its way into theaters in the dregs of late September, opened to middling business, and fell predictably into the warm embrace of couch potatoes on DVD. There are two main points I’d like to make about Serenity. 1. It’s about as good an adaptation as anyone had a right to expect, swiftly paced and full of the humor, adventure, and irreverence that made Firefly so special. 2. Whenever I’m inclined to think the ’00s were far more exciting for TV than for cinema, Serenity is Exhibit B. (Exhibit A being The Wire, of course.) For Whedon, converting Firefly into a two-hour movie is an act of compression, not expansion. The film’s effects are splashier and the choreography is more elaborate, but the job of squeezing in a season’s worth of mythology—and bringing the story to a real conclusion—is virtually impossible to pull off. Whedon’s task was not unlike the recent Star Trek reboot, in that he had to reintroduce a cast of TV characters. But it was much harder, because Firefly was never part of the cultural lexicon, and thus more difficult to shorthand. Because there’s so much heavy lifting to be done in the introductions alone, Whedon wisely keeps the plotting simple: The government wants River back at all costs—as much for the secrets she knows as her potential for destruction—and they’ve sent The Operative, a Man With No Name-type played with sinister bloodlessness by Chiwetel Ejiofor, to track her down. Finding out the big secret the Alliance is hiding—a whopper, and one with a strong connection to the technology-as-tool-of-oppression theme of Dollhouse—is the lynchpin to the Firefly series, and Whedon delivers that revelation with the full force it deserves. A strong vein of libertarian paranoia runs through Whedon’s work (“People don’t like to be meddled with,” says young River. “We’re in their homes and in their heads, and we haven’t the right”) and Serenity sees it through to a future where a totalitarian government, in seeking to calm and appease the masses, robs them of their humanity. Yet the need to drive the narrative forward and turn Serenity into a thrilling space adventure—which, again, it definitely is—often betrays the laconic charm of the TV show. Though it had its share of narrative through-lines and mini-arcs, Firefly was slightly more episodic than other Whedon shows, content to follow Mal and the gang on various missions of the week on the outer planets. It was a relaxed, funny, smartly conceived hour with occasional bursts of action, building its tone around Fillion’s old-school toughness and way with a one-liner. And with all that time to stretch out, Firefly was democratic in giving all the players their due; it’s the nature (and boundless promise) of television that shows can take advantage of the limitless space for character development, and that’s something Whedon has understood from the beginning, well before the current wave of novelistic TV shows. So there’s a divide inherent in Serenity: The Browncoats have a tremendous amount of investment in these characters, but their fates are probably not so urgent to people who are only just learning their names. Hard as he tries to bring general audiences into the fold, Whedon doesn’t entirely solve this dilemma, and winds up hanging onto several “for fans only” developments that never would have made the cut in a stand-alone film. Whedon puts too much of a gloss over relationships that reprise the romantic tensions of the TV show without advancing them much, like the frisky interplay between Mal and Inara (who’s peripheral to the film’s story), and Kaylee’s pining over Simon, who was always too hung up with his sister to pay much attention to her. (Though Kaylee has one of my favorite lines in the film, when she openly admits, “Goin’ on a year now, I ain’t had nothin’ twixt my nethers weren’t run on batteries!”) More inexplicable is the brief appearance of Shepherd Book (Ron Glass), whom Firefly fans remember fondly as a former passenger of mysterious origin, and non-fans know as some guy whose heroic martyrdom is given inexplicable weight. Even the death of a major character in Serenity opens up a rift: on opening night, I heard plenty of gasps and sniffles from the Browncoats (some of whom did indeed show up in the garb). But outside of the initial shock—Whedon has been known to kill off characters swiftly, and this one is breathtakingly fast—the mourning is left to the die-hards. For whatever reason—let’s just say the general suckiness of humanity—Serenity wasn’t a box-office smash, which dispelled for a while any hope that Whedon would carry George Lucas’ populist science-fiction mantle into an infinitely cooler future. But it realizes a fantasy that advocates of other brilliant-but-cancelled TV shows usually only experience in fan fiction: It brings a beloved series to a natural, satisfying close. (Let’s face it: Even successful TV series don’t often come in for a graceful ending. Most of them overstay their welcome or peter out meekly.) And the only way to account for that is passion. A few loud voices raised in unison sounded like a much larger chorus to a studio, and with Serenity, Whedon and his followers got away with something.